With the largest refugee population per capita in the world, Lebanon now officially hosts at least 1.1 million Syrian refugees alongside a local population of approximately four million. Until late 2014, the Lebanese government maintained de facto open borders and little to no regulation of Syrians within its borders. This period has largely understood as one of state absence: referred to broadly as a “policy of no-policy.” This paper aims to advance and nuance this notion in two ways. First, I look at the way in which state inaction played a major role in structuring the responses that did emerge, both “below” and “above” the state, that is namely by local authorities and international agencies. Second, I shed light on how indirect measures taken by the central government facilitated and encouraged greater local autonomy in governing the refugee presence, while simultaneously denying municipalities central funds and rendering them even more dependent on international aid. This, in turn, further decentralized and fragmented the current set of responses to the Syrian refugee crisis in Lebanon and legitimized discretionary action by municipal authorities. I begin by briefly outlining the Lebanese political context during and in the run-up to the early years of the Syrian uprising, under which it was seemingly impossible for the Lebanese government to develop a comprehensive response to the refugee influx. This changed, ultimately, with the pronouncement of the 2014 October Policy, broadly recognized as a critical shift in the government’s response to the refugee presence. Without denying the significance of this change, this paper focuses primarily on the period preceding the October policy. In doing so, I aim to “mov[e] away from an emphasis on active and observable intervention” to take seriously the critical role that inaction can play in shaping outcomes. The Syrian uprising and ensuing conflict posed a particularly distinct challenge for the Lebanese government. Since the assassination of former Prime Minister Rafik Hariri and Syria’s withdrawal from Lebanese territory in 2005, the Lebanese political class has largely been divided between factions broadly considered loyal (“March 8”) and opposed (“March 14”) to the Syrian regime. 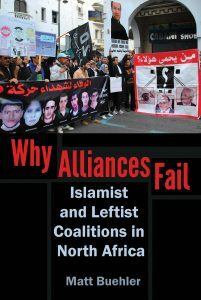 This polarization was accompanied by a great deal of political instability. From 2011 until 2014, Lebanon went through three changes in government under the authority of three different Prime Ministers. Prior to the election of Michel Aoun in October 2016, the country had been without a President for over two years. Adding to this constant change of leadership were long periods of deadlock and political vacuum, as the formation of new governments consistently brought to the fore major divisions and extended political jockeying. For the purposes of this paper, it is important to note that political actors, and analysts, at the time were gravely concerned about the potential for the country to be drawn into the conflict in Syria. This fear of “spillover” led the Lebanese National Dialogue Committee to adopt the 2012 Baabda Declaration, which affirmed (among other provisions) the commitment of political actors in the country to “eschew block politics and regional and international conflicts […] and avoid the negative repercussions of regional tensions and crises in order to preserve its own paramount interest, national unity and civil peace.” In contrast, little attention was given to the importance of managing the refugee presence as both political factions in the country wagered that refugees would be a short-term reality; they believed the conflict itself would be resolved relatively quickly—albeit with each faction predicting vastly different outcomes. This greatly lessened the sense of a need for a comprehensive response to the refugee influx and made the presence of refugees more vulnerable to political instrumentalization. As the number of Syrians in the country grew, so did divisions within March 14, particularly on the subject of refugees: by late 2013, Geagea was calling for the creation of “safe areas” in Syria to which refugees should be relocated—a position previously primarily advocated by March 8. The Syrian elections of May 2014, when thousands of Syrians came out in support of President Assad in Beirut, proved to be a pivotal turning point in the domestic political landscape. This moment catalyzed the development of a greater consensus on the need to address the refugee presence, culminating in the adoption of the October Policy a few months later. Adopted by the Council of Ministers, this policy explicitly aimed to “reduc[e] the number of displaced Syrians” by severely limiting return to Syria or through resettlement to other countries, strengthening security provision, and “alleviating the burden” of “displaced Syrians” on the Lebanese economy and labor force. At the time of adoption of the October Policy, the registered Syrian refugee population in Lebanon had reached over 1.1 million. While the North and Bekaa—the two first regions to receive Syrian refugees—continued to have the largest number, the population had spread widely throughout the country [see Figure 1]. The central government’s attempt to provide an over-arching policy added yet another layer of governance within a context of already fragmented authorities. The following section highlights the ways in which two critical inactions by the central government helped shape the complex landscape that emerged. The first of these inactions was the decision to maintain the pre-existing border entry regulations. Lauded for allowing for relatively unfettered access to the territory, this inaction—often misrepresented as an explicit open border policy—resulted in the maintenance of an ambiguous legal status for Syrians in the country. In addition, the government’s refusal to build refugee camps—or develop an alternative central shelter policy—formed arguably the most critical inaction of the response; it propelled unprepared and under-resourced municipal authorities into a central and at times contentious role. As a result, in lieu of a state retreat and emergence of a “UN ‘surrogate state’” as has been seen with previous refugee movements in Lebanon and elsewhere in the Middle East, the response to the Syrian refugee influx has been characterized primarily by its decentralization and ambiguity. Prior to the changes outlined in the October Policy and the ensuing border measures adopted by General Security in early 2015, Syrians entered Lebanon on the basis of a 1993 bilateral agreement that allowed for the relatively free movement between the two countries. Under these conditions, a Syrian individual could enter Lebanon through an official border crossing and be granted residency for six months, with the possibility of free renewal for up to one year (after which it could be renewed for a fee for another two six-month periods). Exceptions and further provisions were in place if a Syrian required residency for a more extended period of time. Critically, no provisions were put in place to distinguish between Syrians fleeing conflict and Syrian labor migrants, of which there were already between 300 and 700 000 in the country. This lack of distinction was echoed in the United Nations High Commission for Refugees (UNHCR) registration procedures in the country, whereby any Syrian who arrived at a UNHCR registration office, following a short interview and formal procedures, would receive a registration document and access to aid and services. Not quite a prima facie recognition, registration was done on the basis of an abbreviated refugee status determination process, and only 1.5% of those who requested refugee status were denied. The Government of Lebanon appeared to accept UNHCR’s authority in this process. However, it refused from the onset to use the term “refugee”, preferring the word “displaced”—a word with less historical, and legal, weight. The importance of this designation was severely called into question in mid-2014. First, in the aftermath of the aforementioned mobilization of Syrians to vote in the Syrian elections, March 14 leaders—previously the strongest political advocates of refugees in Lebanon—called for the removal of the label of “displaced” for all those who voted in the election. This was quickly then followed by the Lebanese government asking “UNHCR to review the cases of all Syrians registered with the Office [UNHCR] who had gone to Syria and returned to Lebanon after June 1, 2014.” Their return to Syria, in the eyes of the government, made their claim to refugee status subject to question. According to UNHCR, 16 000 Syrians had their refugee status “inactivated” following this review. The conditions of these inactivations remain opaque, but point to the potential for these ambiguous legal categories to be the subject of contention and ultimately politicization. In turn, this would prove instrumental in justifying the government’s decision to halt to the registration of Syrians in May 2015 on the basis of a need to overhaul the refugee registration system entirely. As of that date, Syrians may be “recorded” within UNHCR’s database, have access to services and aid, but cannot receive UNHCR registration documents granting them de facto refugee status. The ambiguity of the distinction between “refugees” or “displaced” on the one hand, and Syrian migrants on the other came up repeatedly in interviews with municipal and regional authorities. In one case, a district official told me that a municipality I was planning on visiting—one where over 2000 Syrian refugees were registered as of January 2015—“had no refugees.” By that, he meant that most Syrians there had previously been in the village as seasonable laborers, and now had returned to settle more permanently with their families. Syrians I met in that village did often have long-standing ties to it as labour migrants, but had brought their families to settle with them only following the beginning of the conflict in Syria. This was the case for many—if not most—Syrians in Lebanon, who either have family ties and/or labor ties in the places they settled. This dual identity, exacerbated by a border policy that did not acknowledge humanitarian entry, has made Syrians more vulnerable to popular attacks of an unjustified claim of being “true” refugees. The second critical inaction was the government’s refusal to build official refugee camps or alternatively adopt any central shelter policy. The reasons for rejecting encampment relate in large part to what Shadi Karam, Senior Advisor to then-President Sleiman and later Chief Advisor to Prime Minister Tamam Salam, called “a fear…a paranoia [within the country]…concerning what could be related to the Palestinian experience.” While non-encampment has the potential of greater freedom and rights for refugees, the lack of adoption of an alternative shelter policy created challenges for both UNHCR and for local communities who became the primary hosts of Syrian refugees. In addition to the oft-cited challenges of efficient aid distribution within non-camp settings, the self-settlement of Syrian refugees across Lebanon’s over 1700 localities has meant that UNHCR must contend with a wide variety of partners as well as competitors. This has meant an extensive effort at “coordination” with often mixed success. Over 70 partners are identified as partners within the 2015-2016 Lebanon Crisis Response Plan, but this number greatly underestimates the number of NGOs operating on the ground who choose to remain outside of these multilateral forums. The self-settlement of refugees also placed a disproportionate and unequal pressure on local communities and municipal governments. Despite their legal independence as local authorities (solta mahaliyye), municipalities have thus far been excluded from any formal policy-making role with their representation within the development of the Lebanon Crisis Response Plan being limited to the Ministry of Interior and Municipalities (MoIM). However, through their ability to control access to refugee populations, municipalities became critical interlocutors for UN agencies and NGOs working on the ground. In mid-2013, UNHCR created the position of Liaison Officer within its operations, whose primary role is to maintain and enhance with relationships with local authorities. Despite their exclusion from the formal policy arena, this frontline role helped enhance the power of municipalities and transformed them into one of the most critical actors within the refugee response. This role has not been unequivocally positive, however. The first major sign of tensions came in 2012, when a number of municipalities in Mount Lebanon laid banners within their villages and towns banning Syrians from movement from evening to early morning, effectively putting in place discriminatory curfews within their geographical boundaries. Despite garnering noticeable media attention, the measures did not prompt any immediate response from the national government. When pressed by journalists, then-Minister of Interior and Municipalities Marwan Charbel specified that these curfews were “illegal” as they fall outside of the mandate of municipalities. Throughout 2013, this practice became more commonplace, spreading beyond Mount Lebanon. By mid-2013, curfews were being reported regularly in Protection Working Group meetings. A study conducted by REACH/OCHA among 252 communities found that curfews were the most common form of “community” or municipal guideline. The report states that within 83 communities, at least 50% of surveyed residents report the presence of a curfew. A Human Rights Watch report conducted in 2014 cites at least 45 municipalities across the country that had implemented similar guidelines. In my own research, I have identified 142 municipalities that have put in place curfews aimed at Syrians. Due to the underreporting and difficulty of tracking curfews, this number undoubtedly underestimates the scale of the phenomenon. While curfews, and other so-called “community guidelines,” are often understood and analyzed as a purely local-level phenomenon—alongside issues of “host-community tensions”—it is critical to place them within the broader context of national policy. At times, this can be more explicit than others: for example, there is evidence that the government security cell in the Nabatieh qada (district), which includes the district governor as well as representatives from all state security institutions, and reports directly to the MoIM, issued a statement recommending curfews to all municipalities in the district (al-Masri 2015). However, I would argue that this extends beyond these instances of explicit directives. After unsuccessful attempts in 2013 to centralize data on Syrians through regional security cells, central authorities took measures that emboldened and strengthened municipal authorities to take on a more direct role in the governance and security response. This, in turn, legitimized greater decentralization and informalization of the response, and in particular its security elements. As the MoIM expanded the role and duties of municipal authorities, the funds allotted to them did not follow suit. While municipalities can levy their own taxes, the rate of collection varies greatly from municipality to another but, on average, is quite low and estimated to be around 50%. Most municipalities rely almost exclusively on transfers from the central government. In 2013, transfers to municipalities dropped 11.7% compared to the prior year (from 669 to 591 billion LL or approximately 446 to 394 million USD). While this improved slightly in 2014, when the transfers were increased to 709 billion LL (approx. 472 USD), it did little to alleviate the situation of already impoverished municipal budgets as transfers from the Telecommunications tax earmarked for municipalities had not been disbursed since January 2010. By December 2014, this had amounted to over LL 739 billion in revenues (approx. 492 USD). One outcome of this budgetary deficit was the increased reliance on private contractors (haras), who are paid daily rates and remain outside the official municipal budget, to provide security within municipalities. These contractors were specifically mentioned and legitimized in the main articles of the security plan, and included within the provisions of the circular on the use of weapons. Despite the institution of these measures, the MoIM has continued to argue that municipal curfews and discretionary violence by municipal police targeting refugees is illegal, and even arrested (and then promptly released) municipal police officers involved in a heavily mediatized incident where Syrian men were detained in the central square of a village while police officers confiscated their identification documents. This distancing, I argue, serves an important political role: framing these instances as a purely local, extralegal or even illegal, phenomenon is an attempt to alleviate the state’s responsibility for them while allowing the government to use their presence as evidence of greater need to support Lebanese institutions and host communities. In this sense, they figure within the broader narrative of host-refugee tensions that increasingly animates the international humanitarian response in Lebanon and justifies a shift away from a focus on refugee rights towards a policy of stability and containment. As I have demonstrated, the multiplicity of responses to the Syrian refugee influx in Lebanon cannot be understood without an analysis that places their co-constitution at its center. While local agencies and international organizations, namely UNHCR and its partners, emerged as the central actors in the early policy response in the country, their ability to emerge as such was enabled by core inactions by the central state. In this way, I aim to contribute to a growing interest in moving beyond “a bias in the social sciences towards the study of political activity, to the virtual neglect of political inactivity.” In my analysis, critical inactions by the central state in Lebanon played a major role in enabling the emergence of alternative actors, whose actions were ultimately bounded and structured by the context created by these inactions. Moreover, I argue that the increasingly decentralized and informal security approach to the refugee presence was structured by the central authorities’ legitimization of ad hoc, and illegal, actions taken by municipal authorities in this period. As a result, I argue that it is now misleading to view these policies as a reflection of purely, or even primarily, local drivers. Instead, I argue that emphasizing the seemingly localized and informal nature of these practices allows central state authorities to simultaneously distance themselves from them and use their presence as leverage to shift greater international donor support towards Lebanese host communities and Lebanese state institutions. Lama Mourad is a PhD candidate at the University of Toronto. This research was supported in part by the International Development and Research Centre (Ottawa, Canada), the Social Sciences and Humanities Research Council, and the Department of Political Science at the University of Toronto. Karim El Mufti, “Official Response to the Syrian Refugee Crisis in Lebanon, the Disastrous Policy of No-Policy,” January 10, 2014, http://civilsociety-centre.org/paper/official-response-syrian-refugee-crisis-lebanon-disastrous-policy-no-policy. Allan McConnell and Paul t’Hart, “Public Policy as Inaction: The Politics of Doing Nothing,” 2014, 3, https://ssrn.com/abstract=2500010. Saad Hariri until June 2011; Najib Mikati from June 2011 to March 2013; Tammam Salam from January 2014 until December 2016. For more on this, see Filippo Dionigi, “The Syrian Refugee Crisis in Lebanon: State Fragility and Social Resilience” (LSE Middle East Centre, 2016). An institution that has its roots in the early days of the Lebanese civil war, the National Dialogue Committee brings together leading political and sectarian leaders to discuss key issues of contention. It was revived in 2006 in the aftermath of the assassination of Prime Minister Rafik Hariri, and has been resorted to on many instances since as a way to overcome (with mixed success) political gridlock on key issues related to national stability. See Farid El-Khazen, The Breakdown of the State in Lebanon, 1967-1976 (Cambridge, Massachusetts: Harvard University Press, 2000), 315–22; The Monthly, “39 Years of Lebanese Dialogue From the National Dialogue Committee to the Baabda Dialogue Committee” (The Monthly Magazine, October 9, 2014), http://monthlymagazine.com/article-desc_1495_october–39-years-of-lebanese-dialogue-from-the-national-dialogue-committee-to-the-baabda-dialogue-committee#sthash.WKvYpK13.dpuf. Permanent Mission of Lebanon to the UN, “Baabda Declaration Issued by the National Dialogue Committee on 11 June 2012” (UN Security Council, June 11, 2012), http://www.securitycouncilreport.org/atf/cf/%7B65BFCF9B-6D27-4E9C-8CD3-CF6E4FF96FF9%7D/Lebanon%20S%202012%20477.pdf. Interview with Senior Advisor to the Minister of Interior and Municipalities, July 2016. Nader Fawz, “14 Adhar Tahtafil Fi Wadi Khaled: ‘qariban Fi Homs’ [14 March Celebrate in Wadi Khaled: ‘soon in Homs’],” November 14, 2011, http://www.al-akhbar.com/node/25637. The Lebanese Forces, Speech by Dr. Geagea on the Occasion of the Remembrance of the Martyrdom of Prime Minister Rafik Al-Hariri, YouTube Video, 2012, https://www.youtube.com/watch?v=DX4L41Osfe8. NOW Media, “Geagea Calls For ‘safe Areas’ in Syria for Refugees,” NOW Lebanon, October 5, 2013, http://www.al-akhbar.com; Mohamad Mohsen, “Qouwa 14 Adhar Toughayir Mawqafuha Min Al-Nazihin Al-Souriyiin: Al-Tarhil Man Sharak Fi Al-’intikhabat [‘14 March’ leaders Change Position on Syrian Displaced: Deportation for All Who Participated in the Election”,” Al-Mayadeen, May 30, 2014. Unpublished documents, Decision 38, Minutes of the Council of Ministers Meeting, October 24 2014. Documents provided anonymously to the author. Michael Kagan, “The UN ‘surrogate State’ and the Foundation of Refugee Policy in the Middle East,” University of California Davis Journal of International Law and Policy 18 (2012): 307–42. The General Security Office categories were instituted in three stages, on 31 December 2014, 13 January, 3 and 23 February 2015. These dates are specified in: United Nations High Commission for Refugees (UNHCR), “Refugee Response in Lebanon Briefing Documents,” March 2015, http://www.europarl.europa.eu/meetdocs/2014_2019/documents/droi/dv/95_finalbriefingkit_/95_finalbriefingkit_en.pdf; United Nations High Commission for Refugees (UNHCR), “Refugee Response in Lebanon Briefing Documents,” March 2015, http://www.europarl.europa.eu/meetdocs/2014_2019/documents/droi/dv/95_finalbriefingkit_/95_finalbriefingkit_en.pdf. The individual decisions are no longer available on the GSO’s website, but the complete entry requirements are available: Directorate General of General Security, “Tandhim Doukhoul Al-Souriyin ’Ila Libnan Wa Al-Iqama Fiha [Regulating the Entry of Syrians into Lebanon and Residence within It],” accessed January 12, 2017, http://www.general-security.gov.lb/ar/posts/33. Syrian Lebanese Higher Council, “Agreement on the Regulation of Transport of Persons and Goods between the Lebanese Republic and the Syrian Arab Republic,” 1993, http://www.syrleb.org/docs/agreements/05PERSONS_GOODSeng.pdf. Syria Needs Analysis Project, “Legal Status of Individuals Fleeing Syria,” June 2013, http://www.alnap.org/resource/8587. More precise estimates of the number of Syrians in the country are largely impossible to ascertain as most Syrians worked in the informal sector and did not register with the Ministry of Labor. For a more in-depth analysis of the migrant Syrian population in Lebanon, see John T. Chalcraft, The Invisible Cage: Syrian Migrant Workers in Lebanon, Stanford Studies in Middle Eastern and Islamic Societies and Cultures (Stanford, Calif: Stanford University Press, 2008). According to UNHCR, the main reasons for rejection were (1) the applicant was already registered; (2) they were Lebanese. See: Lebanon Humanitarian INGO Forum, “Background Paper on Unregistered Syrian Refugees in Lebanon,” July 15, 2014, http://lhif.org/uploaded/News/d92fe3a1b1dd46f2a281254fa551bd09LHIF%20Background%20Paper%20on%20Unregistered%20Syrian%20Refugees%20(FINAL).pdf. “14 Adhar: Sifat Al-Nuzuh La Tantabiq ‘Ala Al-Souriyin Almousharikin Fi Al-Intikhabat Alyawm [March 14: The Label of Displaced Does Not Apply to Syrians That Participated in Today’s Election],” Annahar, May 28, 2014. United Nations High Commission for Refugees (UNHCR), “Refugee Response in Lebanon Briefing Documents,” 3–4; A further 5,500 registrations were revoked, at the request of the MoIM, for Syrians who had arrived in the country following the enactment of the new entry measures by General Security in January 2015, See The Daily Star, “UNHCR to Cross 5,500 Syrian Refugees: Derbas,” The Daily Star, August 29, 2015, https://www.dailystar.com.lb/News/Lebanon-News/2015/Apr-29/296164-unhcr-to-cross-off-5500-syrian-refugees-derbas.ashx. Interview with District Official, North Governorate, August 2016. Shadi Karam, “Lecture: Post-UN General Assembly Summit on Refugees and Migrants” (Issam Fares Institute for Public Policy and International Affairs, American University of Beirut, October 24, 2016). Interview with UNOCHA, January 2016. Al-Sharq, “Qoura Libnaniya Tufrud ‘hadhr Tajawwul’ ‘ala Al-Souriyyin Wa Tamna“ ”istiqbal Laji’in Judud [Lebanese Villages Impose ‘curfews’ on Syrians and Prohibits the Welcoming of New Refugees],” April 21, 2013, http://www.alsharq.net.sa/lite-post?id=810992. Inter-Agency Coordination, “Protection Working Group Meeting Minutes,” July 17, 2013, data2.unhcr.org/ar/documents/download/37916; See also: Inter-Agency Coordination, “Protection Working Group Meeting Minutes,” June 19, 2013, https://data.unhcr.org/syrianrefugees/download.php?id=2299. 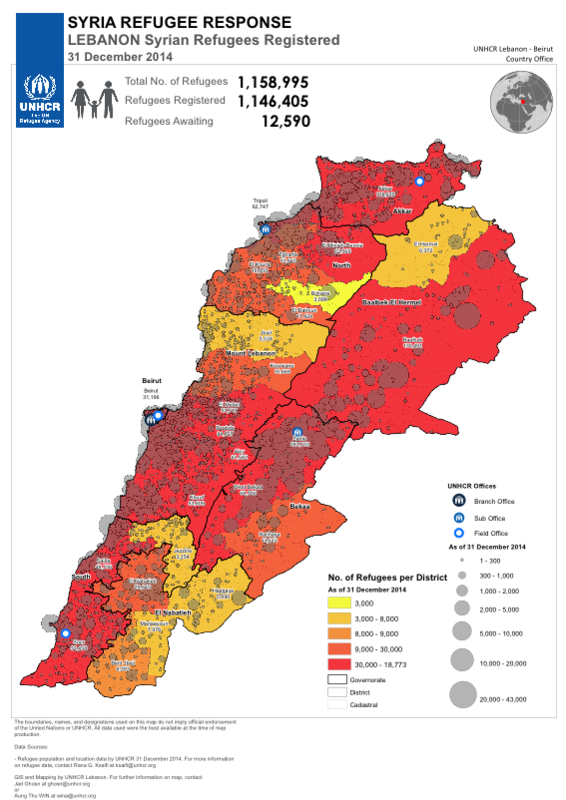 Human Rights Watch, “Lebanon: At Least 45 Local Curfews Imposed on Syrian Refugees,” October 3, 2014, https://www.hrw.org/news/2014/10/03/lebanon-least-45-local-curfews-imposed-syrian-refugees. This figure relies on data collected during a year of fieldwork in Lebanon, as well as newspaper articles and NGO reports. Ministry of Interior and Municipalities, “Decision no. 242: Creation of Regional Cells within Regions Belonging to the Central Security Cell Tasked with the Follow-up on the Situation of Displaced from Syria,” Published December 8, 2012. Retrieved October 12 2016 [No longer accessible on site]. An-Nahar, “Charbel Yutliq Khutat ’ishrak Al-Baladiyat Fi Hafz Al’istiqrar Wa Tawfir Shabakit ’aman [Charbel Announces Cooperation Plan with Municipalities for Maintaining Stability and to Provide a Safety Net],” An-Nahar, September 6, 2013, http://newspaper.annahar.com/article/64582. ALEF: Act for Human Rights, “Two Years On: Syrian Refugees in Lebanon,” September 2013, 24. Mona Harb and Sami Atallah, Local Government and Public Goods: Assessing Decentralization in the Arab World (Beirut, Lebanon: Lebanese Center for Policy Studies, 2015). Ministry of Finance, “Public Finance Report 2014,” 2015, http://www.finance.gov.lb/en-US/finance/ReportsPublications/DocumentsAndReportsIssuedByMOF/Pages/PublicFinanceReports.aspx. Interviews with Senior Advisor to the Minister of Interior and Municipalities, July 2016, August 2016. New TV, “Amchit: Alqabd ‘ala Alnazihin Laylan Wa Al-Qabd ‘ala Al-Shurta Sabahan [Amchit: Arrest of Displaced at Night and Arrest of the Police in the Morning],” July 14, 2016, https://www.youtube.com/watch?v=bcIqTFY2bwg; Future TV, “Al-’ifraj ‘an ‘anassir Baladiyet ‘amchit…’ilaykom Al-Tafassil! [Release of Amchit Municipal Police…Here Are the Details! ],” July 14, 2016, https://www.youtube.com/watch?v=3fsEBdxQAl0; OTV, “Madha Yaqul Nazihu ‘amchit Wa ’ahluha ‘an Tihmet Al-‘onsoriye? [What Do the Displaced and People of Amchit Say about the Claim of Discrimination? ],” July 14, 2016, https://www.youtube.com/watch?v=sfsa2HNEW80. McConnell and t’Hart, “Public Policy as Inaction: The Politics of Doing Nothing,” 2. The Legal Agenda, “Qararat Hadhr Al-Tajawul Dhodh Al-’ajanib Wa Dhodh Al-Muwatinin Al-Souriyin Gheir Qanouniye [The Curfews Against Foreigners and Syrian Citizens Are Illegal],” July 14, 2016, www.legal-agenda.com/article.php?id=1650>.